Team Stronghold Top Fundraiser At 2017 American Heart Association Heart & Stroke Walk. 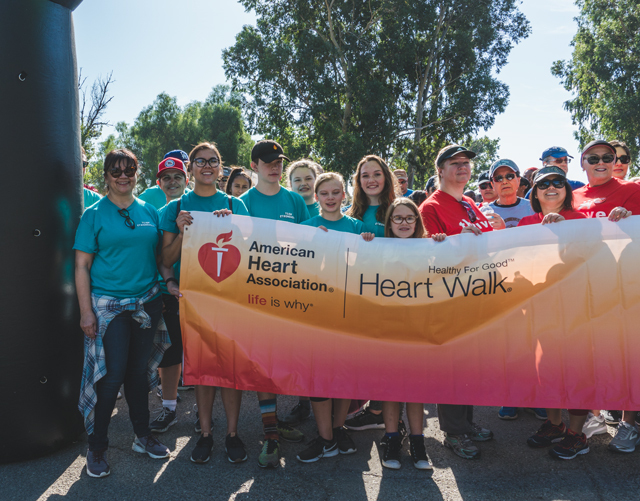 This past weekend saw thousands of Inland Empire community members gather together for the 20th Annual AHA Heart & Stroke Walk at Rancho Jurupa Park in Riverside, CA. The Heart Walk began in 1997 as an essential event in raising funds for research and preventative care for heart disease and stroke. The event welcomes individuals, families, companies and even survivors for a day of unity and education on the importance of physical activity and healthy living. There was even fun for the kids, including a Stronghold Motorsports Sponsored Kids Zone which featured a bounce house, giveaways and two Stronghold Motorsports race trucks for the kids to sit in and take photos. For the more competitive individuals, the event also included a timed 5k run before the walk, which Stronghold had two members up for the challenge. A congratulations to Robert Stuart on taking the first place finish in the 18-40 division and his son Robert for taking the second place finish in the under 18 division. Stronghold is a longtime supporter of the American Heart Association and a strong believer in Health & Wellness in the workplace, and every year the Heart Walk remains an important event for Stronghold Engineering and Stronghold Motorsports. The Stronghold Team works hard every year on raising money for the event through raffles, snack bars, donations from vendors and simply giving what you have in your pocket that day. With a 2017 goal of raising $27,500, Team Stronghold not only surpassed that goal, but nearly doubled it with a total donation of $51,629. “It appears that our company has the Biggest Heart in the Inland Empire! I am so Blessed to be part of a team that cares not only for each other but also for our community at large. It’s amazing what a small group of diverse and caring individuals can collectively achieve together.” – Beverly Bailey, Stronghold Engineering President/CEO. Stronghold Engineering earned the top fundraiser in the “Companies” category, Stronghold Team San Jose earned the top fundraiser in the “Teams” category, and Beverly Bailey took home the win in the top “Fundraisers” category. A huge accomplishment for Team Stronghold and for the American Heart Association who raised over $500,000! “As the Heart Walk Director, I am so blessed and honored to work with Stronghold Engineering year around to help move the needle in the health and wellness of our community. Stronghold Engineering embodies everything that the American Heart Association stands for with the wellness committee, employee benefits and overall corporate structure. Stronghold Engineering employees seem like family more than colleagues and I am so happy to be working with this amazing family.” – Jessica English, AHA Business Development Director, Inland Empire Division. Along with the Heart Walk this year, Stronghold also held their company picnic & campout weekend, and celebrated their 26th birthday at Rancho Jurupa Park. Friday night kicked off with a potluck dinner, a movie under the stars and some good ole campfire fun. After an early morning wake up call and a three mile walk, Stronghold employees and their families were treated to an awesome lunch catered by The Habit food truck, a live DJ, and endless fun for the kids with bounce houses, water guns fights, outdoor games, face painting, Giant Jenga and more! The evening continued back at the campground with more games, a Taco Man dinner catered by Stronghold employee Juan Sosa, music entertainment provided by team DJ and Stronghold employee, Javier Echeverria-Ortiz, campfire smores and some intense Giant Jenga action. Stronghold would like to thank everyone who helped make the event such a success and to everyone who donated to the American Heart Association.